How to make a birthday tutu for a party craft or party favor. Fun and easy craft idea for a ballerina, fairy or any type of girl party. Use as decorations and by placing on chairs around the party table. Let the party guests wear them at the party and then take them home as a great party favor! Easy to make tutu's for girls of all ages. Ribbon (at least 1" wide) or wide elastic for the base of the tutu. Depending on the age and size of the party guests count on about 3 feet per guest. Tulle for the skirt. 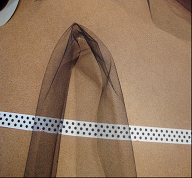 Cut wide tulle into pieces that are 5" wide and 3' long (more or less depending on age). For this tutu I used some tulle on a large spool that was 5" wide that I bought at a craft store during Christmas to wrap packages. 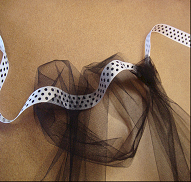 Ribbon (if desired) to place in between the tulle. Attach the strips of tulle to the ribbon (or elastic) using a larks head knot. Fold the tulle in half and place the loop over the ribbon. Fold the loop under the ribbon and then pull the two ends through the loop. Pull towards you and tighten around the ribbon. 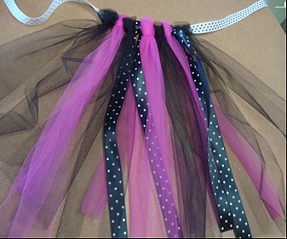 Keep attaching the tulle to the ribbon until it is as full as you would like it to be. 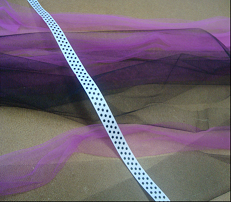 Alternate two or three colors of tulle if you like. 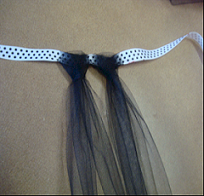 We added black / white polka dotted ribbon to our tutu (see top picture). When finished tie onto party guests waist.